I’m a big fan of words. The idea that you can arrange letters and spaces in such a way as to change minds, inspire emotion, and create art is powerful and almost magical. And the idea that you can do the same thing to ruin someone’s day or knock them down a peg is a different kind of magic, but just as eagerly sought. Spell Quest: Grimm’s Journey falls into the latter, “words can hurt” camp. But they’re hurting monsters, so it’s probably alright. 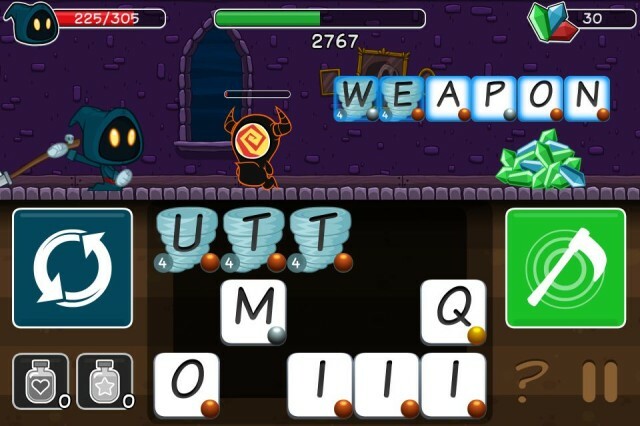 Spell Quest is a word game with role-playing elements in which you assist a cute little reaper in his mission to rid over 30 stages of the foul beasts contained within. You do this by spelling words from the board at the bottom of the screen; the longer the word, the more damage it does. Some letters are more powerful than others, like in Scrabble. 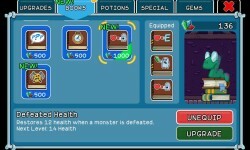 The game also includes jeweled letters that unlock bonuses when you use them. Enemies can also cast effects on the board to make things more difficult for you by making tiles unusable or harmful to Grimm. The longer the word, the more damage it does. While time-trial levels do unlock after you’ve cleared a stage once, the main game doesn’t have a timer. And I appreciate that because word games’ insistence on giving me a panic attack is not really something I enjoy. The RPG elements arise through leveling abilities and purchasing gear to make Grimm stronger and his words more effective, and it’s not the deepest system I’ve ever seen, but it will give you reasons to replay previous levels when you hit a wall. It’s addictive and cute, and it’s deep enough to keep you busy for quite a while. The Good: Interesting concept with no timer to freak you out; plenty of replay value. The Bad: You’re going to hit some walls and fail through no fault of your own because random letters are random. The Verdict: It’s a cool, relatively stress-free take on word games, and anyone who likes pushing letter tiles around should check it out.